When I think about English records I think of The Kinks’ The Village Green Preservation Society, The Smiths’ The Queen is Dead, The Who’s Quadrophenia and The Jam’s All Mod Cons. To me all those albums are quintessential English. All of them are fantastic albums. It’s their third full-length LP. It took it’s title from a British idiom one might find in housing advertisements, is short for “all modern conveniences” and is a pun on the band’s association with the mod revival as well. Of Course it is also Paul Weller’s view on the music business as a ‘con’. 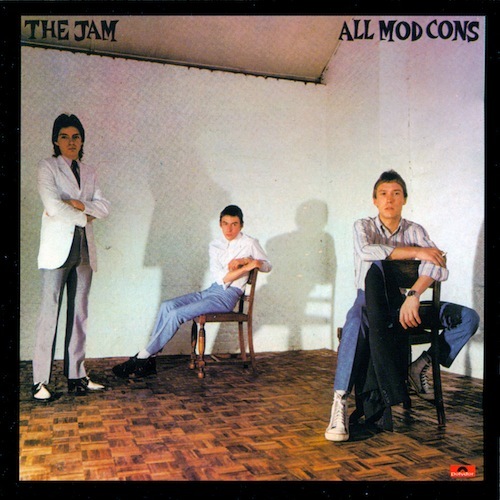 This Is the Modern World is the second studio album by British band The Jam, released in November 1977, less than seven months after their debut. The front cover photography was by Gered Mankowitz. “This Is The Modern World reflects a definite PROGRESSION (remember that?) a definite identity mould. Here Weller is making an obvious attempt at creating a Jam SOUND. He succeeds. Brilliantly”.